I have other articles named Portal scanned, in case something terrible happens to them. Which it's just about to. 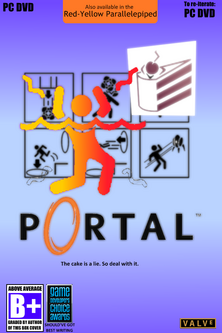 Portal's box art hints at its less-than-common aspects of gameplay: incineration and cake. Portal is a single-player Source-engine first-person science-fiction puzzle-action meme-causing smart-alec scalp-tearing video game by Aperture Science, dba (doing business as) Valve Software. An innovative, not overly long, well-written, critically acclaimed, award-winning game that pushed the boundaries of how gamers perceived a game's environment and physics, it is mostly known for cake, the Companion Cube, and that song at the end. A sequel, Portal 2, was announced and demonstrated at E3, received critical acclaim and awards before its release, and proceeded to be released to more critical acclaim and further accolades. Portal first began development in 1988 as a text adventure, at Infocom. Realising that that proposed sequel to the Hitchhiker's Guide to the Galaxy game was set up to be a witty, smart and challenging game to be prized by generations of gamers to come and thus was as good as shelved, and that having grues attack players in the dark was getting a little stale, Infocom's developers and writers finally scrambled for a new franchise to revive investors' interest in the company. Various proposals were introduced, including a text adventure based on Tom and Jerry—which writers realised would turn into a repetitive cat-and-mouse game—as well as an adaptation of A Tale of Two Cities or Oliver Twist—before Infocom realised that no text adventure faithful to any novel in Charles Dickens's œuvre could possibly ever fit in a reasonable number of floppy disks. Ultimately, the team decided on a new project, tentatively titled Portal, that would return to Hitchhiker's-style witty writing and science fiction. Copyright (c) 1989 by Infocom, Inc. All rights reserved. You wake up in a small room. There is a radio on the coffee table, playing in the background. There is a small toilet here. After spending most of their budget on story, plot, puzzles, those funny little "feelie" things that come with the game, and what was highly impressive coding to be implemented in a text adventure, Infocom suffered the worst of the economic climate, and, after one last feeble attempt at revival with yet another Zork game, went bankrupt. that was the original idea's title. the students' name for the project could not be spelled on the contract. they include plenty of references to cake. Two months were spent on designing the levels; three months on play-testing, voice acting and soundtrack composing; and two years for the writers to come up with a story whose inclusion of cake made even the remotest sense. This gem was left over from the development process. To obtain it, you must commit some sort of crime with the portal device, as the device cannot handle illegal operations. Portal's gameplay mainly consists of a series of puzzles solved by making gaping holes in the fabric of space-time, using the Aperture Science Handheld Physics Destroyer™. These holes, or portals, are connected visually as well as spatially, so as to prevent blindly jumping into what may be a fire pit at the other portal. When the surfaces accommodating the portals are nonparallel, momentum redirection results in illogical motion contrarian to normal Newtonian motion of objects in three-dimensional space-time, or, as the recent Patent Office approval requires us to say, the Aperture Science Illogical Motion Contrarian to Normal Newtonian Motion of Objects in Three-Dimensional Space-Time™, dpa (destroying physics as) "flinging". This feature allows for an interesting technique. A player may jump from a high ledge to enter a portal on the floor, only to be ejected from an other portal located on a nearby wall and dropped from some height back into the floor portal, causing the player to fly across the room at near-terminal velocity. If the player is fast, and the room is large enough, this may be repeated multiple times by relocating the floor portal to where the player is about to land. Theoretically this may continue ad infinitum (et ultra); however, real-life limitations tend to be motion sickness possibly leading to delirium and jumping out of windows due to illusions of invincibility to high falls. Occasionally, gamers have criticised the lack of variety in weapons, as there are no weapons available to the player aside from the almighty power to manipulate the fabric of space-time. All of the gameplay techniques listed above are exclusive to Aperture Science, dba Valve Software. If you are developing another game that allows for rapid displacement between two discontinuous points in space-time, please notify us so that we may sue you into bankruptcy. Here's looking at yourself through some ludicrous miracle of the space-time continuum ... kid. Portal is set in the Aperture Science Computer-Aided Enrichment Centre, where convicts go to be enriched and most certainly not be burnt to death after wasting away through 20 test chambers™. The facility is run by Aperture Science, a company that appears to exist for the sole purpose of attaching ridiculous names to mundane objects, using a technique trademarked as Aperture Science Running the Joke into the Ground™. The player, in the character of Chell, is completely isolated, perhaps except for GLaDOS, a murderous, paranoid computer, not at all similar to HAL 9000 except for glowing-red security cameras, certifiable insanity, murderous intent, and a knack for singing upon deactivation. The facility contains twenty test chambers, each involving highly varied elements, such as creepy talking sentry turrets, graffiti about cake and unrequited love for inanimate storage cubes with hearts painted on them, and constant promises of cake. This would seem strange normally; however, since the game is set in the Half-Life universe, in which the Marine Corps try to kill you and theoretical physicists are folk heroes, it seems mundane in comparison. The player, in the character of Chell, wakes up from stasis, and subsequently is forced through a series of puzzles in the Incineration Centre. Throughout the "test chambers", as a motive for completing these esoteric, worthless, horribly murderous tests, GLaDOS promises Chell cake. Apparently Chell is just as insane as GLaDOS is, since she thinks nothing of this. Chell proceeds through the Centre, while noticing GLaDOS's gradual mental psychosis from years of isolation, exhibited by her mandate to incinerate an inanimate storage crate. The facility is also revealed to be in severe disrepair, and crawlspaces have been vandalised with statements like "the cake is a lie", which makes no sense unless you are either GLaDOS, or one of those bakery owners that know the pain of having their patisseries ransacked by vigilantes. The facility is also full of Aperture Science High-Energy Vaporization Units™ (also known as Aperture Science Beating a Dead Equine Animal™), and cute little turrets that specialise in literally friendly fire. Players may assume that Chell is in an equal state of mental psychosis and disrepair, since she proceeds through everything without a single qualm. Since the player is controlling Chell, the player is now playing with insanity as well. This ending scene was proposed, but eventually rejected because of a "stack overflow." Meanwhile, GLaDOS does have an even more sadistic and haphazard plan in store, involving baking Chell into cake to safely prevent her from violating the End User Licence Agreement for the portal device. 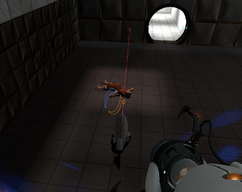 However, with the portal gun and a incredibly conveniently placed platform overlooking the "oven", Chell escapes. Despite GLaDOS's threats, she navigates to GLaDOS's computer room, where GLaDOS briefly contemplates on the futility of survival and existence and free will, before declaring war by firing missiles and releasing neurotoxin. Chell then realises that the only way to fix GLaDOS up is by completely destroying it, which she proceeds to do before abruptly seeing a giant hoop fall out of nowhere with no warning whatsoever, and then conveniently passing out to wait for the sequel. 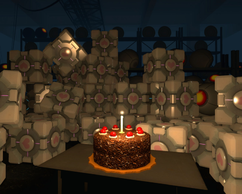 The final scene shows a tedious journey through the innards of the Incineration Centre ending with a Black Forest cake and a reincarnated Weighted Companion Cube. The end credits features Jonathan Coulton's "Still Alive", which, despite the excellent ambient tracks and voice work featured throughout the rest of the game (read: the actual game), appears to be the only piece of audio that players remember from this game. Portal can be played with audio commentary enabled, meaning that every time the player points at one of many large, speech balloon icons scattered throughout the game in crawlspaces and corridors, he can hear a developer getting excited about how they managed to remove a gameplay element through extensive play-testing. A common flaw in earlier level designs was the ability to shoot portals through portals, since that would make everything too easy, and they wanted to challenge (read: torture) the player's mind. Also removed from the game was the Rat Man, because "even the name freaked everyone out." Most of the plot is also left scattered throughout the game in crawlspaces and corridors, divided into plot-shaped pieces and often barely visible. These "narrative" extras include: a PowerPoint presentation on GLaDOS's origins as a de-icing apparatus, an idea so insane the writers likely thought they could not possibly write a believable character with cake and de-icing as characterisation devices; notes for another test subject who was a chicken and, presumably, failed because the supervisor was too hungry; and various Aperture Science propaganda posters planted throughout crawlspaces as a merchandising ploy for vulnerable fans. Achievements for the game are available on Xbox 360 and Steam. Examples include: flinging 300 feet and actually trying out every room to see if it was possible; falling 30000 feet and actually waiting at the computer screen for all of the fifteen minutes that this takes; spinning around until you get too dizzy and throw up; doing something smart followed by something quite idiotic; and running around the facility like a maniac throwing all the security cameras off the walls. Portal's final first-person scene in Crash Every 10 Minutes Mode. Rendered in dark grey: the forest. The game also has various alternate reality games (ARGs) that revolve around the game's environment and characters. 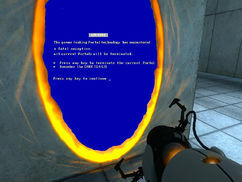 Fans running Portal on a computer older than 2 years were granted access to a secret ARG based around "Crash Every 10 Minutes Mode", a feature imposed upon these older machines. The feature actually does not do what its name implies, and instead crashes the computer whenever it feels like doing so. The fans' objective was to find various commands in the "Developer Console" that would disable the feature, at which point the game would congratulate the player by actually working correctly. Portal has had positive critical reception from its infancy; even hard-boiled reviewers find the game hard to criticise, and indeed having Zero Punctuation defending a game's faults is an admirable feat. Some have alleged that this is only because the game made them murder the Weighted Companion Cube and feel guilty. However, it may just be due to the fact that the game is far ahead of its time, is paradigm-shifting and really innovative, and just rocks. This second possibility is extremely improbable, and most side with the Companion Cube conspiracy. Portal has also won several awards for innovation, soundtrack, sinister villain, and even for being best puzzle game, best game with portals or even game of the year. A full list of awards may be purchased from Aperture/Valve for $41.99 (£23.95), bound in a sturdy leather hardcover. Proceeds were used to fund the sequel, which, with your help, actually became a whole game.